Equipped with an automatic Swiss model DW1501, 30 mm diameter, 48 stones, with a frequency of 28,800 vibrations per hour, 42-hour power reserve, as well as display functions of hours, minutes, seconds and date. Come watch on a stainless steel bracelet or black rubber strap. 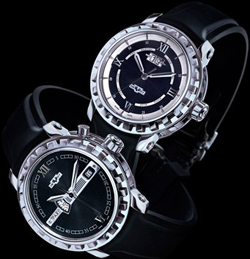 The second model differs from the first mechanism – DW2021, with a diameter of 26.20 mm. Compiled by 46 caliber stones, has a frequency 28,800 vibrations per hour, 42-hour power reserve, with features indicating the hours, minutes, seconds, date and second time zone. Both new products are limited edition -200 copies.